Our Ring Fingers! Taken the day after. Updated: June /13/11 We now a slideshow of the wedding below! Note: These are randomly selected amateur photos taken by my friends (click each to show enlarged photo above) - Please stay tuned for the 'real' ones. A few more Pictures below. Thanks to Michelle and her team at the Wedding Planner Plus; they made our wedding the perfect one anyone could have imagined! Everything was neatly, efficiently and splendidly done! I thank the almighty God for his grace and mercy. Not sure if you were aware, but from the week leading up to the wedding, Jamaica was getting persistent rains, not just daily, but sometimes throughout the entire day! But I, and many others, prayed and; listen to this, not a drop of rain fell during the morning before, nor during the proceedings. However, the minute we signed off, maybe about 9:15pm, it started to pour, and at this point, 2 days later, we are still getting rains! Call us lucky, but I believe it was a blessing - our prayers were answered. 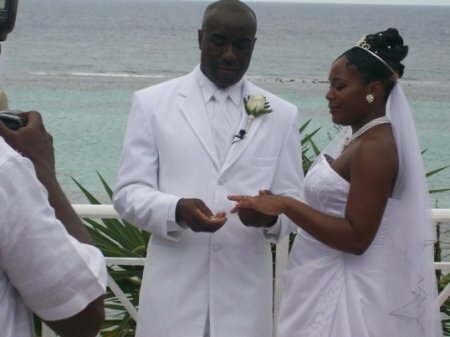 Both the ceremony and the reception were held at the tranquil, serene and undisturbed Hibiscus Lodge Hotel in Ocho Rios - yes they deserve the free advertisement :-). They were also very efficient from the get-go. Well no, I mean, not really :-). But seriously though, anything with such meaning, impact and significance, must cause a bit of nerves, doesn't it? I was very comfortable and confident though. My wife? She was probably a bit more nervy but clearly enjoyed herself thoroughly. 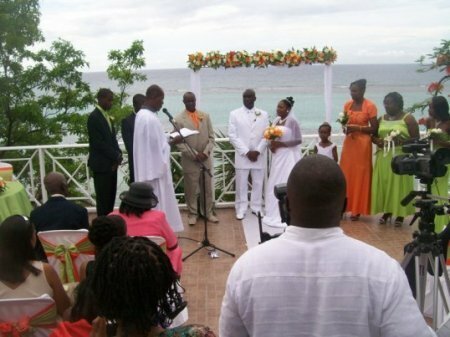 The ceremony was held on the balcony over (literally) the beautiful Caribbean sea - with the blossoms of a beautiful poinciana adding to the perfect backdrop; that was breathtaking! I doubt my friends' photos did any justice to the scenery. Moreso, what the pictures could not capture were the serene, perfect atmosphere; the gentle wind blowing and the sweet cooing and singing of the pigeons, doves and baldplates that were right there! It seems the birds were nesting in one of the almond trees by the sea. (By the way the hotel seems to really love birds, they had lots of other birds around). from the sea, and that was what happened! A tourist party boat passed us by with thumping reggae music! Right after the ceremony, the bridal party, danced off, including me :-) to take some amazing photos! I must pause here to big up the photographer and the videographer; really great and professional gentlemen! I'll get their names later. We took pictures on the front lawn, several sections of the garden as well as by the pool- the pool ones will be extra stunning. though - and hungry. My wife conceded that her cheeks were tired of smiling! The staff was very efficient at this I must mention again. I guess don't need to mention the quality of the food either, do I? I heard we did a good great job cutting the cake, feeding each other and sharing wine! (lol). Special thanks to 'Auntie Sharon', Omeil's mom, and my Grandma 'Dadda' for the blessing and unveiling of the cake. All the toasts were brilliant. Holly Allen, one of my wife's best friend, toasted her and Neilkamar, friend and one of my cricket team member, toasted me. Just before my (The Groom's) reply, my wife took the stage and sang for me! That was, I mean (**stuttering**), I didn't - and still don't know the words to describe it. Just awesome! I managed to complete it though (lol) but I did get a bit emotional; I was giving my appreciation to everyone and of course, I had to mention my great-grandmother "Mammy", and my mom and dad - the three persons who had the greatest impact on my life. All three passed away within the last few years! They were the only ones who should have been there to witness this, but weren't. I paid tribute to them by asking the audience to stand with me and observe 30 seconds of silence as my toast to their memories! I really felt that one. And while the tear fell down my face (my wife was right there with me by the way), I noticed several of my friends and other family members and friends sobbing too. The tears turned into joy though as we danced the first dance! Yes, me again dancing! My wife, who is the dancer, whispered the next foot moves to me(lol). The bridal party followed, then others in the room! It definitely was, and not just fun, memorable !!!! So what are the highlights for me? The singing of my cousin Kadian. 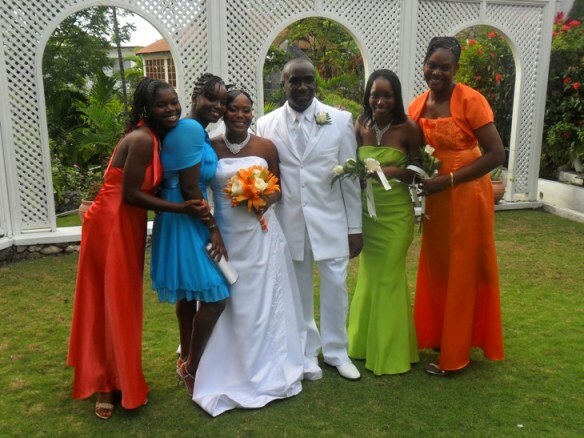 The beautiful colours - of the bridal party and the decorations. The photo shots! Again, kudos to the camera man. The birds singing in the background during the ceremony. The adeptness of the videographer. The delight on the face of my daughter. & of course, my wife's singing! 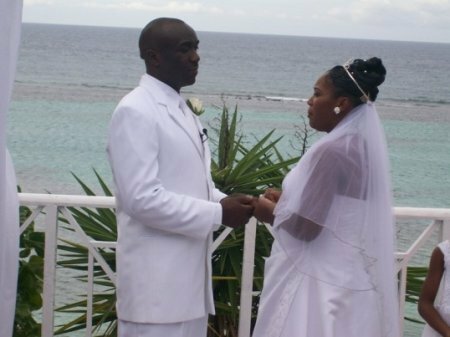 On behalf of my wife, I must (again) say thanks and 'big up' to everyone who made June 4, 2011, our wedding day, the most memorable! P.S. Please feel fell to share your thoughts and feedback on the comment button below. That was such a beautiful video. Loved the suits and gowns on everyone. Such a HANDSOME COUPLE!!! I wish you both many many many years of happiest years together. GOD BLESS YOU and your Beautiful Wife and Family. Wow it's already a year! Happy anniversary guys and all the best in the years to come. Happy Anniversary Wellesley and Omeil. I enjoyed your beautiful wedding pictures and I truly wish you a lifetime of happy, smiling years together. Beautiful wedding. May you both be a living example of how a perfect marriage should be. Always keep God first and your life will be blissful. Just want to send my blessings to the both of you on your union. The pictures are beautiful and Omeil was a beautiful bride. Congratulations to the both of you. I looked at the photos, they are breathtaking. it make me feel like want to get marry right now. wish you guys all the very, very best in your marriage. may God bless you two and bind you two together, like cords that cannot be broken. Love. peace, Respect. Soooo Beautiful!!! Wishing that this happy moment will follow through for the rest of your lives!!! God's richest blessings!!! JUST WONDERFUL.THIS IS REALY A MOMENT IN TIME!!!!!!!!!!! I wish your family all the best in the future .God's richest blessings .May he continue to answer your prayers as he did with the "sun request" That's touching. We serve a loving, caring and compassionate GOD. You just keep the communication line open . He is always only a prayer away. 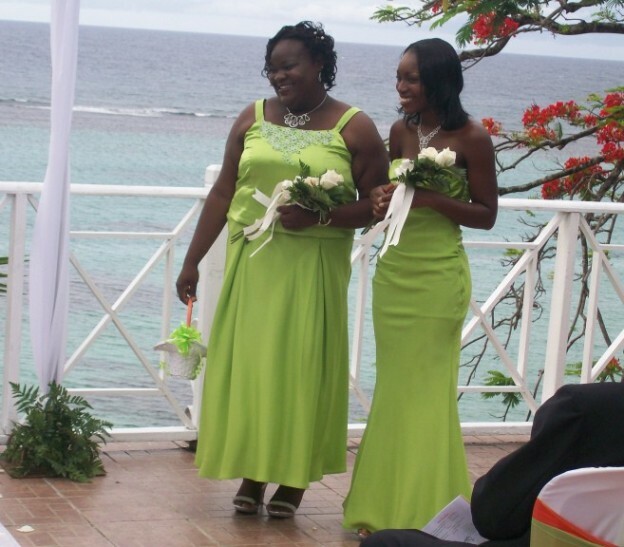 Thanks for sharing your "dream Jamaican Wedding"
Simply beautiful ! Congratulations to the both of you. May God bless and guide you forever. Much love from me . Congratulations on your wedding, love the unusual colors! Congrats big man . You did it. I love the colours. Have a happy marriage that's what counts. 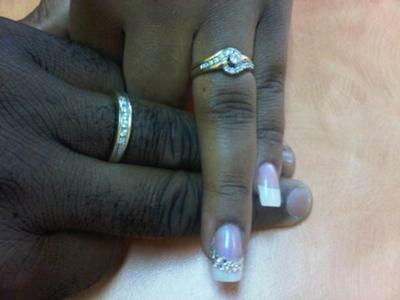 congratulation and may all the blessing that the good Lord hav to offer be yours and remember COMMUNICATION is the key . be bless my fren. "Truely, Marriage is Honourable" Congrats!! Let the sweet perfume of your love water each other's soul in love and unity, till there is no more to say, then-I love you! Congratulations Omeil on this your special day in marriage:)!God Bless you. "Bless be the tie that binds"
Congratulations to two beautiful people that God hath joined together which no man shall put asunder. May you both learn to trust Him for His promised light unto your path!! Congrats bro!, put God at the centre of all you do, may he keep your marriage and may it be fruitful in all areas, be blessed. congratulations. Wishing you all the best and a very happy life together. Best wishes as you start your new life together. I cant get enough of your colors. 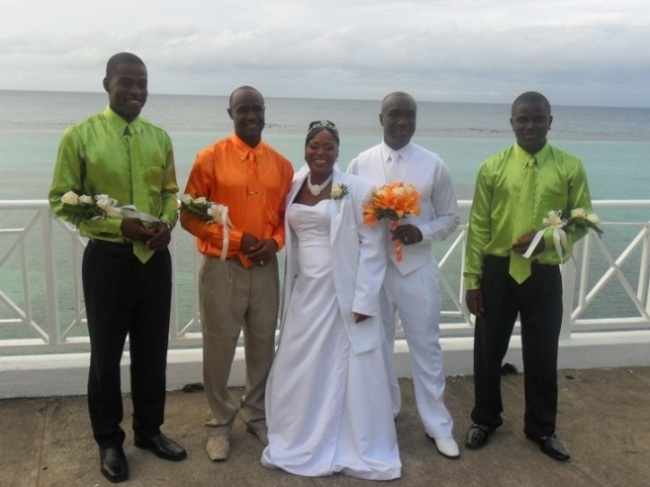 How perfect for a carribean wedding. Congratulations to the Bride and Groom on their very special day and thank you Wellesley for keeping me posted. Man i love the clours the pictures a teck life u two are looking wanderful.I will always pray for u and your wife and promise me that all when the going get tough u two will stick togeather. Love u both and God bless u two lovers. congrats my friend,on making that huge commitment but i sure both of u are committed to each other and this will be a lasting marriage. I wish you and yours all the best for the many years that you will share together.i like the colour combination of ur wedding and you and yours look lovely in those photos. then the party gave out a wild cheer. A little town in Jamaica called Ocho Rios. the Brides-maid and Best man party, an eye catching sight. Pirates came from other Countries and stole our Gold. 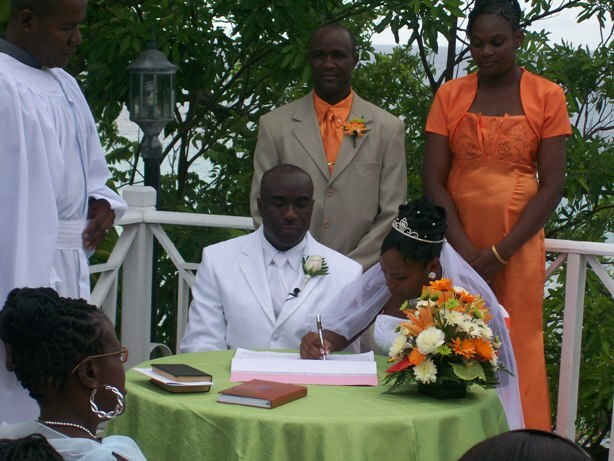 I pray for this couple may their lives filled with joy in a land called Jamaica, where I had fun when I was a boy. To Wellesley and Omeil, Congrats on your beautiful wedding. You seem to have had your own orchestra, "the birds" singing in the background, the whole atmosphere seem so beautiful, may God bless you and your family. I take this opportunity of wishing you both many many years of happy marriage. Congrats on your big day- sounds like many blessings from above with the rain being held off and things going without a hitch. On one trip, my wife and I dined at the Hibiscus Lodge and the next visit we had to stay there- it is an idyllic place- like you said with the flora, fauna, location by the sea and in the heart yet removed from Ocho Rios. 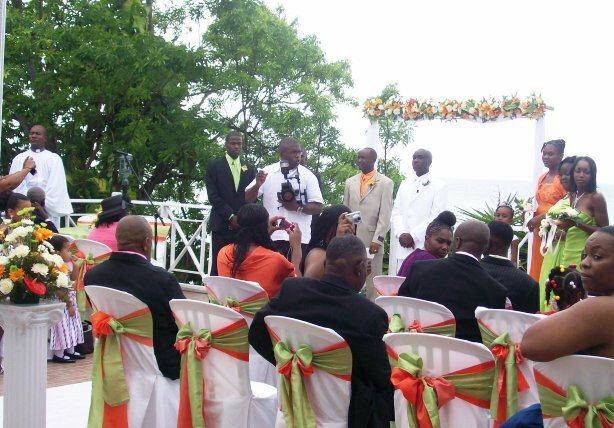 Last year, was the first that I participated in a Jamaican wedding and the concept of the toasts are so different from US weddings- there is a lot more tradition in the Jamaican ceremony. I appreciate you being a man and a model to others, your wife looked like a princess and oh what fun with the bridal party exchanges - I have seen many weddings but this was new! Congrats again and One love in HIM. THANK YOU FOR SHARING YOUR BEAUTIFUL WEDDING YOU BOTH LOOKED AMAZING AND HAPPYNOT FOR GETTING YOUR DAUGHTER . Congrats to you and yours. May our Lord and Savior Jesus Christ continue to bless you and family. I hope you all will continue to grow in Him and call upon him every aspect of your lives. In Jesus name I pray Amen. God bless you three and hopefully there will be another one on the way! lol! Congratulations and best wishes on your nuptials. You both were beautiful and I love your colors Omeil. Wishing you years of happiness and prosperity. To the tune of "Be True". This is just soooo perfect! Lovely pics, nice colour theme. Wishing you (again) God's richest blessing on your marriage. Long life and Prosperity, filled with happiness and joy to you and yours? You both look so wonderful together! All the best and may the blessing of God be on your family! All the best my friend. Remember to put God in the middle and all things will go well with you. Always over-communicate and never take each other for granted. Love each other with all you have. The pictures are wonderful and I enjoyed them very much. Wishing you both rich blessings and a wonderful life together. I look forward to reading your newsletters all the time it is as if i know u in person, when you write, you paint such vivid mind pictures,the pics are lovely, such beautiful bride and groom. The colors are so alive and vibrant, just love the whole settings. need a hook up of that place when i find the one...lol.stay bless and walk good. Well done. It is always good to see two loving persons 'Tying the knot'. Doing the Godly thing. All the best to you both. Congrats, I wish for you a long and lasting love. May God bless you as you start this new journey together. wow fantabulous, i wish for u both all of the blessin from GOD in ur life everyday u live, never spot praying and working on ur marriage by GOD'S good grace u both will make it congrats again. congratulations and many best wishes to you and your lovely bride. the pictures are beautiful and the joy of the day is evident. your story brought tears to my eyes. may JAH blessing be on and in your marriage and family life forever!!! The wedding propa!! I am extremely pleased with all that has taken place. From my own experience it's just a thrilling feeling and overwhelming at the same time to think, "This is really it... I am married". Wellesley and Omeil: Thank you for sharing your beautiful day with all your readers from afar! 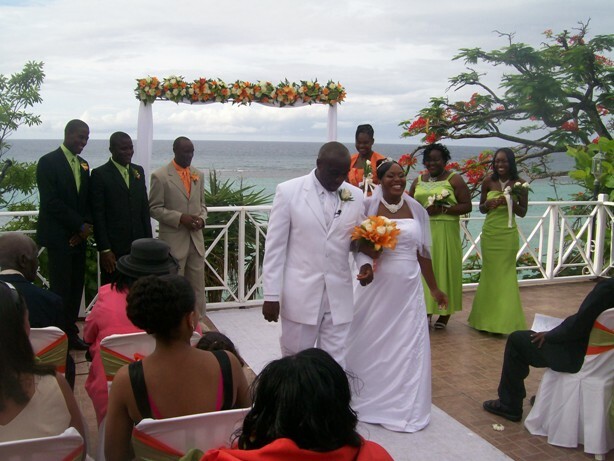 I was married in front of the rock pools at Pointe Village Resort in Negril, Jamaica in 2005. The love and best wishes from all my friends both from Canada, USA, and Jamaica was extra special. May God Bless you, and may you always find the time to say "thank you","i love you", and "i am sorry"! This truly makes my heart happy and I pray that NO OUTSIDE NEGATIVE influences are EVER allowed in your union. Place God first allow him to continue to guide and direct your paths. Wifey please allow hubby to be the man God created him to be for YOU and Hubby allow Wifey to be the woman God created her to be for you. Remember you are one now and made the vows before God so stick it out, go thru it be each others best friend and love love love love love eachother no matter what. So happy for you God bless! Thank you for sharing your beautiful wedding day. I love the story and photos. 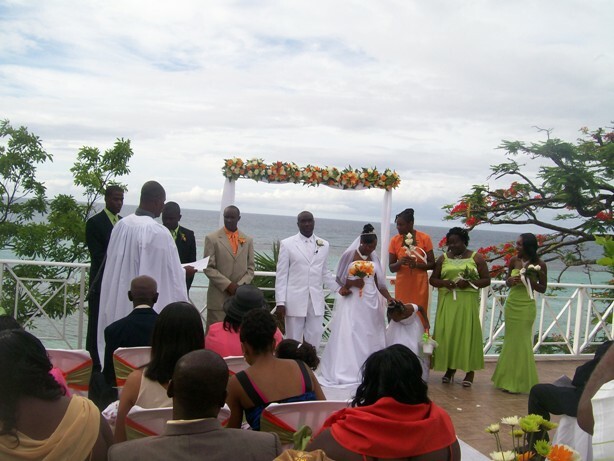 I can't imagine any more wonderful place to be married than Jamaica. Jamaica offers her beauty, spirituality, love of family and friends, and good vibes to anyone who lives or travels there; the love found in Jamaica cannot be compared to any other place on the planet. After my move next year I do hope to meet you both. great in the pictures. The colors selection is very nice, the combination and matching flowers and all. May God continue to shine upon you. Yes mi lion. You and yu Empress a shatt! Love the colours. 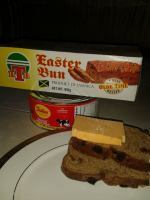 Everyting well set. Boasy piece a wedding. Bless up yuself. Is like me did deh deh fi real. Real tap-a-tap. All the best for the future! Yes mi lion. You and yu Empress a shatt! Love the colours. Everyting well set. Boasy piece a wedding. Bless up yuself. Is like me did deh deh fi real. Real tap-a-tap. Congratulations and all the best to you and your family . the journey has just begun God bless you both. Beautiful Day With Beautiful People! Thanks for sharing this happy occasion with us, your loyal "peeps", Wellesley. 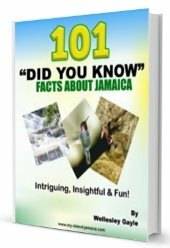 You do so much to keep Jamaica alive in all of our hearts when we view the daily glimpses of real Jamaican life through your great web site. As the popular saying goes, "Life is what you make it." Therefore, you now have the task to make life the way you want it. Then you double that for both of you. And remember the children and other loved-ones. Wess, like I said plenty respect to the man for making a bold jump. 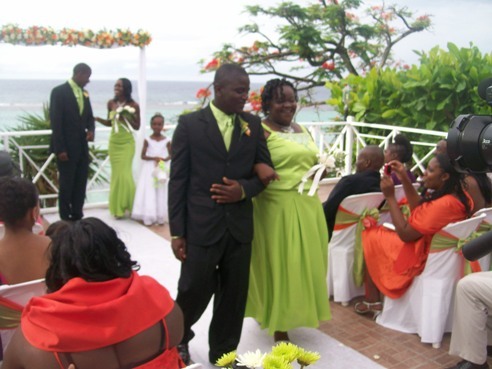 Nuff love to the bride Omeil. Congrats to both of you, let the peace and prosperity continue to provide the glue for both of you. Great decisions come with time, and both of you shard time..so forward in more love and unity. What a nice write-up and great, candid photo shots! Congratulations on your new journey. May it continue to be filled and blessed with love. Your a beautiful couple. God bless. wonderful ceremony,beautiful pics with God in the midstthisc will last forever... congrats!!!!!! Congratulations on your wedding day,you guys looks handsome,the pictures are wonderful,super and full of glamour,thanks for sharing this moment with us,i felt as if i was there,thanks again my friend. OMG ******** this was a beautiful union and the pictures are excellent. I'm so upset that I wasn't there to enjoy in your Wedding Celebration with the both of you. Congratulations to you both and God's richest blessings be upon you always. You were blessed that it did not rain as it has been torrential. God was shining his sun for you,and may it shine on you both for the rest of your marriage. So enjoyed sharing that . Sick it out when things get tough. Make sure you both have God involved in your lives. You will not be able to do it alone. Laugh much, talk much, and pray much. Enjoy the journey. Gorgeous photos, loved the parasol and her fingernails, breathtaking scenery. Many blessings for a long and happy life together, congratulations on your wedding. Congrats & Best Wishes Mr. & Mrs. G.
What awesome pictures - thanks for sharing them. Wishing you both (and your family) a blessed life together. Very nice pictures I can just imagine the actual events I pray that you gguys will grow old together and remember when trouble comes don't complain to. Friends and family both of you hold hands and send a knee mail to your father in heaven Almigty God. guys this is lovely. i hope you bask in the moment and let the moment lasts for a lifetime. God's richest blessing to you both and remember to love each other everyday like you will never love again. lots of love. You both look so beautiful and handsome. I know that your lives together will be Gods treasure. Your journey through life now as a family will be the best years of your lives. May God continue to bind you both as one and that you both will continue to serve God as one. Just want to say congrats again and all the best. I wish both you and your wife a long and happy future together. Seems like a beautiful ceremony, pictures are gorgeous. Well done God bless. Congratulations!!! My wish for you both is to treasure everyday together as you embark on this journey together. Much happiness to you both!!! The pictures are awesome...can't wait to see more! 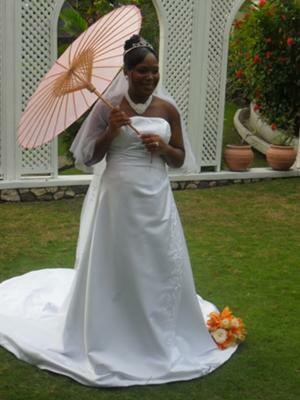 congratulation to you and your bride wellesley, hope you both have a wonderful life together. Congrats to you and your wife. All the best on this new journey of life you've embarked on. May the Lord continue to bless you both. Congrats again mi big fren Wellesley. The pictures are amazing & it seemed you had a wonderful day. All the best to you & your beautiful wife & kids. Hopefully I will see you when I come to JA....p.s keep up the good work in displaying the beauty of our wonderful homeland for everyone to see... Bless! 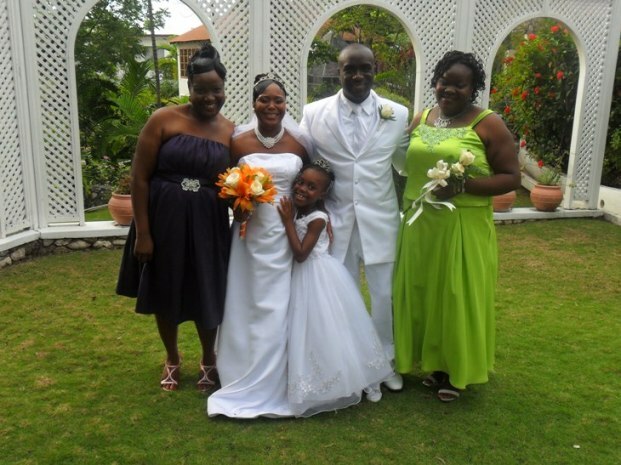 You both look so happy.. Congrats Mr and Mrs Gayle.. I cant wait to see more pics. I don't know either of you personally, but I know your work Wellesley ;-). 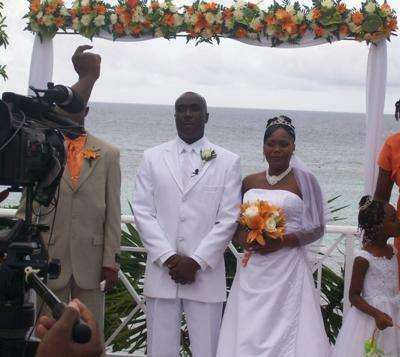 Well done to you both and may you both enjoy a long and happy life together in your beloved Jamaica. One day I hope to visit your amazing island country - it looks fabulous and a truly heaven sent gift with no rain for your special day. Congratulations once again and an absolutely spellbinding post sharing your day with us. Nuff nuff nuff blessings on your marriage and keep sweet for each other!!! Congratulations to Mr. and Mrs. Gayle. Wes, thank you for sharing with us your day. Love the way you describe it all, made me feel like I was there in person. Your bride is beautiful, and you are as handsome as ever, you two make such awesome couple. I love everything about the wedding attire, the decorations, my goodness, such beautiful colors. I can't wait to see the other pictures when they come in. So proud of you Wes, I feel like we are family, especially if I'm correct, you are from my mom's parish of Hanover. Give thanks and praises, you both are bless from up above. Wellesley & Omeil the way you describe your wedding day, I felt as if I was there among families and guests. From the pictures your wedding was sensational. Your wife seem to be so precious, you both must adore each other. I am so happy for you both continue to love each other, communicate, communicate, communicate the key to any marriage. Be continously happy and hope to hear from you soon. By the way, I love the switching of the Jackets and flowers.The scenery was the delightful. Love abundantly and continue to enjoy many more years of each other. Thank you for sharing your special day. I am so pleased the weather cooperated and you had sunny skies. The color of the sea was especially amazing that day. The color palette of the wedding was gorgeous. I can see from the photos how beautiful everything turned out!! You both look some beautiful and handsome. I know that your lives together will be spectacular. Your journey through life now as a family will be the best years of your lives. From the pictures I see, you both look nervous. The dresses were beautiful and the mens suits were very tasteful. All the colors were sensational. Again, Good Luck, God Speed and many years of blissful peaceful times together. I look forward to meeting your family one day. And I also cried as I read about the loss of your family members. Your family feels as if it is a part of me. Beautiful setting. Oh so perfect. I wish you both endless happiness and God's never ending blessings. T love the colour scheme. A long and prosperous life full of happiness to both of you. Your wedding just from reading about it (from you) sounded tranquil, calm, serene, and I know will be a memorably one. I wish you both lots of LOVE, LAUGHTER, HAPPINESS, and above all GOD's Richest BLESSINGS. Here's to many many many years!!!CONGRATULATIONS!! IM wishing for both of you all the good things that life has to offer. I know that with GOD by both of you all side this marriage is going to endure. 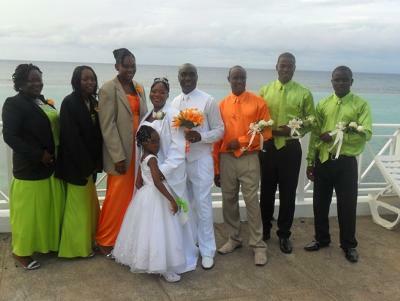 Congratulation mr& mrs GAYLE. Thank you for sharing your special day. Your words and pictures made me feel like I was there with you. May your lives stay blessed as they were on your wedding day!